Every poet’s task is to name the ineffable, to give shape and voice to what haunts them—what haunts us all, if we are honest—while simultaneously giving the ineffable room to speak on its own and for itself. When this balancing act is achieved, we feel it; we give the work space in the interiority of our lives and trust our lives with the truths inhabiting there. 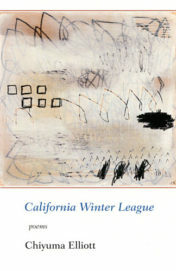 Chiyuma Elliott’s debut collection of poetry California Winter League stands as a totem to the practice of balancing these necessary concerns. The book opens with a collection of poems about baseball legend Satchel Page, who played for some years in the California Winter League (a league for minor and major league baseball players, and the first to integrate). Page was himself enigmatic, so to invoke him is to attempt to discuss the ineffable, an idea that comes to full fruition in the poem “Seventh-Inning Sermon.” Here, Elliott divines her subject, using him to spark a dialogue on all that is transcendent. Elliott likens Page to the biblical David, “how this one rock knocked down the baddest man in the land,” to God and “how God held this round world in his hand,” and to the world itself at its most elemental state of being, “small as an atom, small as a speck, small as / the smallest hole in your leather, [so] no-one will hit you.” Elliott intimates that to witness the miracles Page performed on the mound is akin to witnessing creation itself—and she is convincing. Baptism is hope: it is faith in our eminent salvation. The speaker seeks this hope again at the end of the poem in an effort to reclaim all that has been taken from her, which includes the entirety of the world which “was once / under water” and through no minor miracle “is again” in order to wash away the sins of the earth. 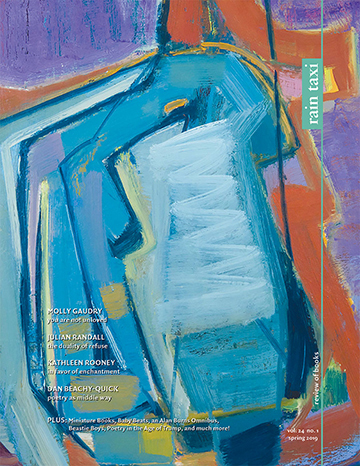 In the final section, the author explores the idea of timelessness as an aspect of the purpose of tragedy in the poem, “Emergency Preparedness.” The speaker and her partner arrive at “home to no hot water; and something / under the living room floor was beeping” (49), which they discover is “the earthquake emergency shutoff valve.” The poem embraces the idea of impermanence, of nonattachment. “At least / we’ll die together if you blow up the house” the speaker says, because the shared (or integrated) experience is greater than our individual lives. The works in this collection wait patiently for the reader to inhabit them, to assume the experience of the lives explored in them. Elliott, with an unbridled generosity of spirit, encourages us to undertake this task, a challenge which we absolutely should accept. This entry was posted in Uncategorized and tagged Fall 2016 on December 8, 2016 by Kelly.